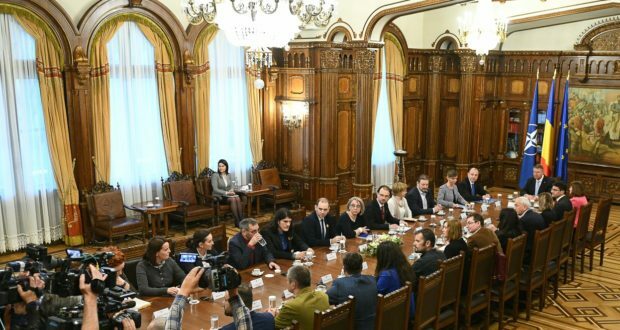 President Klaus Iohannis would have decided to call a referendum for justice on May 26, at the same time with the European elections, the representatives of the civil society have stated today after attending a meeting with Iohannis at the Cotroceni Palace. „One of the versions for the referendum question entails tougher sentences for corruption and abuse of office, a second version refers to the initiative <No criminals in public offices>, and a third one is to stop the steamroller against the justice and to reconcile laws with the European bodies’ recommendations. It depends what question the President will choose, if it is a question or a mix. There can be a question for every message. He told us (President Iohannis) that he is decided to call a referendum at the same time with the EP elections on May 26 and he asked us to come up with suggestions for the question,” NGOS that attended the meeting said. Funky Citizens, Expert Forum, Centrul de Resurse Juridice, Iniţiativa România, Asociaţia Decembrie 89, FreedomHouse România, Centrul Român de Politici Europene, Asociaţia Pro Democraţia, Centrul pentru Inovare Publică, Geeks for Democracy, #Rezistenţa, Vă Vedem din Sibiu, Curaj înainte, Umbrela Anticorupţie Cluj-Napoca, VeDem Just, Active Watch, Consiliul Tineretului din România, Grupul pentru Dialog Social, Corupţia Ucide, but also journalists Emilia Şercan and Mădălina Roşca were invited for the talks at Cotroceni, as representatives of the civil society. The head of state is expected to also meet magistrates this week, probably on Wednesday, on the same topic, but talks with the political parties are also envisaged. A week ago, President Iohannis announced that he is “almost” determined to call a referendum on justice matters, as this is the only way Romanians can show they don’t approve the manner in which “PSD is ruining the justice laws”.